Here’s an update on Larry, Moe, and Curly. Their feathers came in practically overnight. 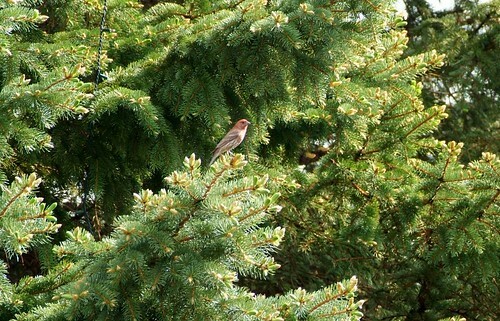 I caught a shot of mom (or dad) in the pine tree yelling at me when I peeked in the nest the last time. Haven’t had a chance to look them up yet, I’m thinking some kind of finch? This entry was posted in my life, photos and tagged my life, photos by Lilli Day aka bookbabie. Bookmark the permalink. Nice Chicks! 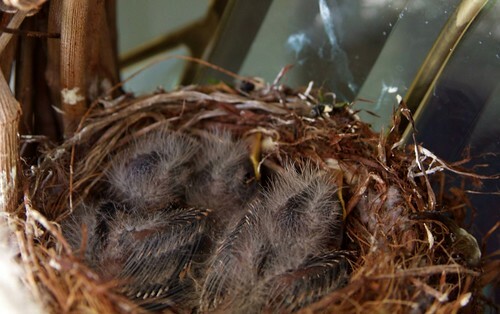 I hope they fledge well. You are right the bird is a finch, a male house finch. The female is duler without the bright reddish color. How’s your Mom doing? Bookbabie, thanks for your words. But i’m not spanish i’m Portuguese. And i want to say agai that a really like your work.